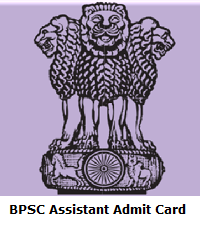 BPSC Assistant Admit Card 2019 is Out…!! The BPSC Assistant Admit Card 2019 is a mandatory document for the candidates who are going to participate in the Bihar Assistant Examination on 17th March 2019. The Bihar Public Service Commission (BPSC) officials released the BPSC Assistant Admit Card 2019 on 11th March 2019. Applicants need to download the Bihar PSC Assistant Hall Ticket 2019 by entering the login credential information. No candidates will not allow into the examination hall without having the Bihar Assistant Call Letter 2019. So all the competitors keep it remember and attend for the exam with BPSC Assistant Admit Card 2019. Moreover, at the below of this page, we have given a link to download the BPSC Assistant Admit Card 2019. The Bihar PSC Assistant Admit Card 2019 will play an important role at the time of examination. All the applicants must download the BPSC Assistant Admit Card 2019 before the examination to skip last minute issues. Candidates whatever information provided at the time of submitting the application form, those details will display on the Admit Card. If any mistake appears, then inform to the higher authority and make the corrections before the exam date. Otherwise, candidates will face a major issue. The Bihar Public Service Commission (BPSC) officials are going to conduct the Bihar Assistant Examination on 17th March 2019. So candidates need to attend for the examination on the scheduled date along with www.bpsc.bih.nic.in. The Bihar PSC Assistant Admit Card 2019 available from 11th March 2019 onwards @ www.bpsc.bih.nic.in. Candidates must carry the BPSC Assistant Admit Card 2019 at the time of attending the examination. Bihar Public Service Commission (BPSC) main page will open. Find the BPSC Assistant Admit Card 2019 link on the home page. Enter all important details and hit on submit button. As per given information, Bihar Assistant Hall Ticket 2019 will open.